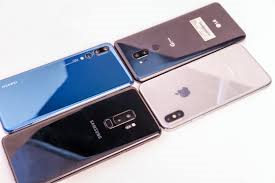 Global smartphone shipments for the third quarter have fallen by 6% over the last 12 months, according to data from IDC. The shipment volume for 3Q 2018 stood at 355.2 million units, compared to 377.8 million smartphones shipped in 3Q 2017. Samsung remains the overall pack leader, but Huawei has made significant ground on the South Korean manufacturer. 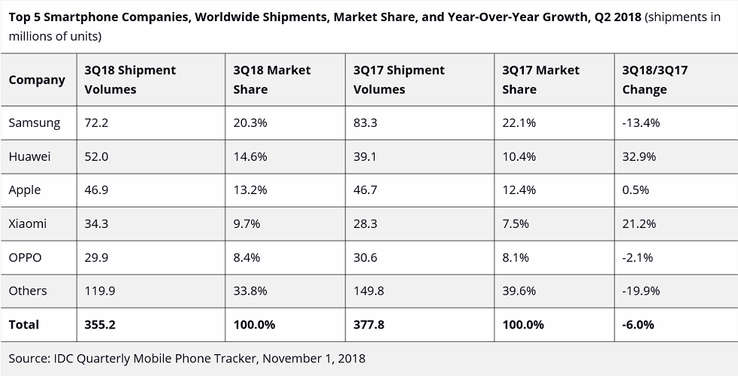 Market intelligence research company IDC has released a report concerning the worldwide smartphone market share for the third quarter of 2018. The overall volume of units shipped has dropped by over 22 million: From 377.8 million (3Q 2017) to 355.2 million (3Q 2018). The analysts attribute this 6% decline to a contracting market in China and falling sales for Samsung. Regardless of the figures, Samsung has retained top spot in the table, shipping 72.2 million units for 3Q 2018, which amounts to 20.3% market share. 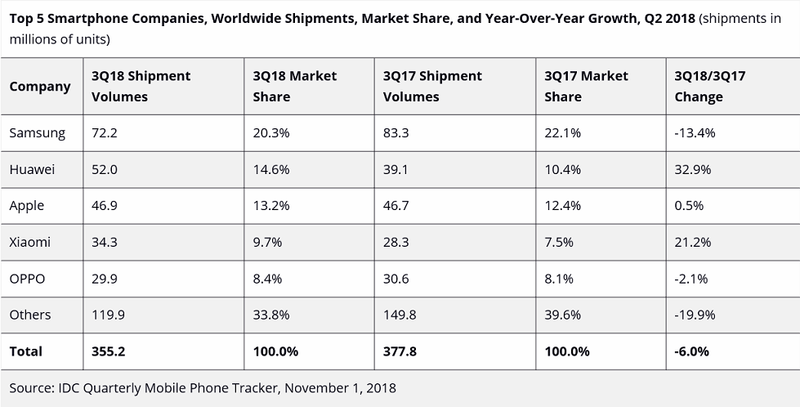 One glaringly obvious point is Huawei’s continuing upward trajectory in terms of smartphone shipments and market share capture. The Shenzhen-based company has improved on the 10.4% market share from 2017, which has risen to 14.6% for the same quarter in 2018. Shipment volumes have gone from 39.1 million to 52 million units, figures boosted by quality products such as the P20 and P20 Pro and the Mate 10 Pro. Xiaomi has also made impressive gains and could soon challenge Apple for third place in the table. New releases could certainly help paint a different picture when the time comes to release the data for 4Q 2018. Apple has been pushing out some very strong products, and Samsung has apparently been busy with both flagship- and midrange-level devices. But it’s still Chinese manufacturers that are making the most out of the global smartphone market.